Crafting time has been a little on the short side over the past few days, as I've been engaged in a major system upgrade at work, meaning that I've been practically camped out in the office. It's a sign of how much "out of hours" work I've done when I call Security to warn them that I'm about to enter a building (and set off all the alarms) and they recognise my voice and telephone number, responding to me by name. With no weekend (OK so there was a Saturday and Sunday, but I worked straight through so they didn't register), long hours and little brain power left when I do make it home, where I am soundly told off by my disapproving cats, I've had to keep any projects simple. Something that can be picked up and put down and doesn't require a huge amount of concentration to work on. I'm calling these the Ork Deathskull Socks and they're intended for Dave, who when I queried him about how this colourway was working up, wondering if it was a bit striking or colourful for his tastes, remarked... "You do know that green and blue are my favourite colour combination, don't you?" It was then that I remembered how many hours he spends staring at his orks trying to get exactly the right shade of green, and the clan he paints are Deathskull, who like Blue. I actually cast these on a couple of weeks ago, to take with me to the AscendancyLRP event up at Murton Park and they've been a background project ever since. At Murton Park we stayed in our usual hut (for maybe the last time - grrrrh) and my only real knitting time was first thing in the morning. 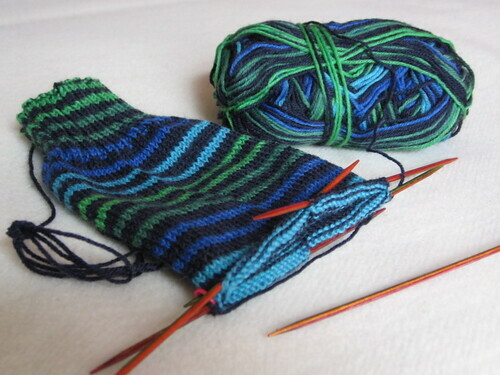 Knitting in the half light of a hut with my new Knit-Pro 2.5mm DPNs, I learnt something new. I learnt that knitting a dark navy yarn, on tiny dark coloured needles, in a darkened hut does not bode well when you're trying to do a K2P2 rib. It sounds simple enough, but when you can't see what you're knitting and therefore can't read the pattern of the rib, it is very easy to loose track and end up with one needles worth of rib completely out of sync with all of the rest. You don't see that you've made a mistake and continue knitting obliviously, only to realise just how much of a mess you've made when you finally get to look at your work in the daylight! So a mental note to myself... Next time I'm intending to take a project somewhere to knit in a darkened hut, I need to choose light coloured needles and a bright yarn, avoiding navy blue at all costs. Very nice, do they do fluorescent yarn, expect they do they seem to have every type of yarn I could possibly imagine and more.